Time seems to be flying by this year, and it’s hard to believe it’s already summer. 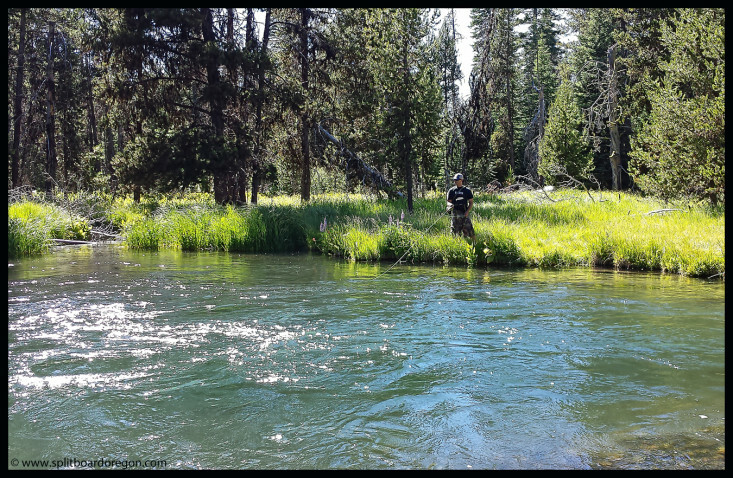 After a great corn filled spring, the timing was right to get out and do a little camping with the family, and if I was lucky, a little fly fishing and snowboarding as well. 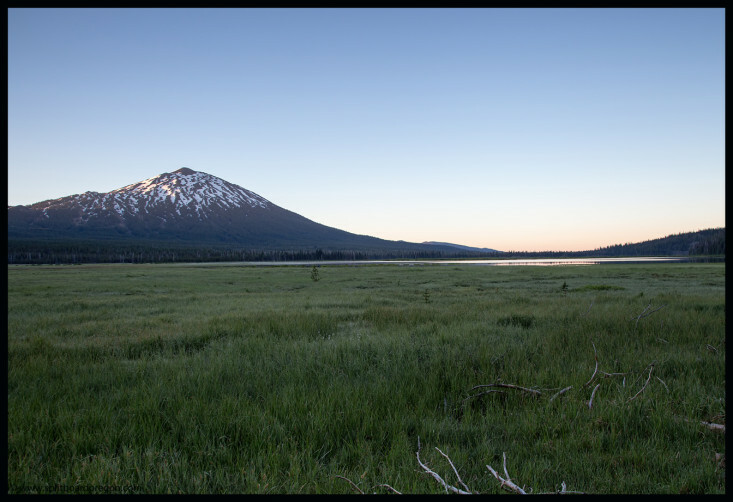 After celebrating the fourth of July the night before, the family and I headed out towards the Cascade Lakes Highway early Saturday morning with intentions of finding a good camping spot for the kids. 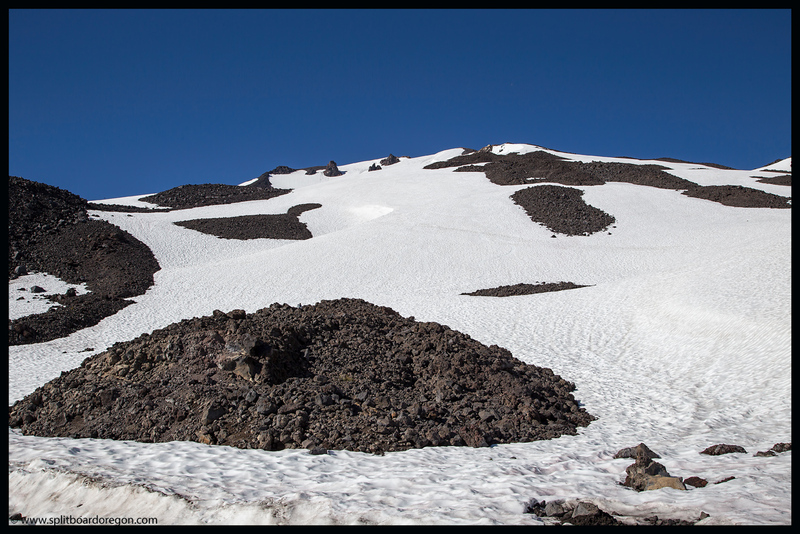 A few hours later, we pulled into the Little Lava Lake campground and found what we were looking for. After pitching tents and arranging our camp, we decided to head out to the Deschutes to let the kids swim and try our luck fishing. At camp that night, the kids played with cousins and I settled in for a couple of beers over the campfire with my wife and sister-in-law. My hope was to wake early the next morning and hike and ride Bachelor in time to make it back to camp for breakfast with the family. My alarm went off around 5:00 am and I was out of camp by 5:30, heading up Cascade Lakes Drive towards the mountain. 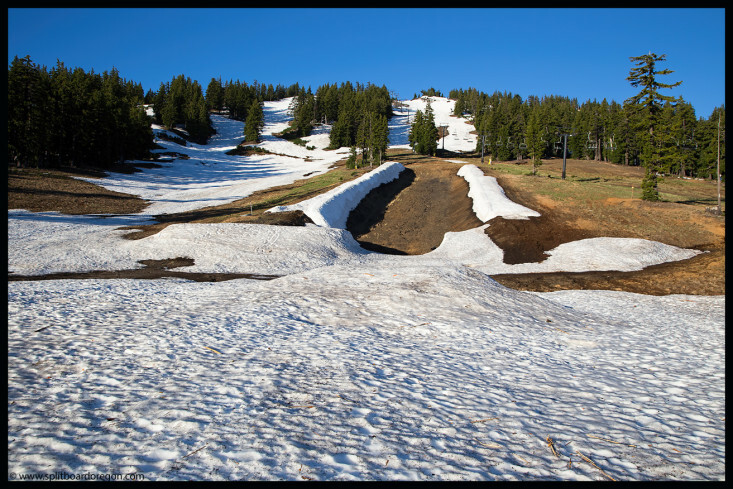 Having just made turns on the mountain six days prior, I knew the snow was melting fast, but was still surprised at just how much had melted off since my last visit. The main lot at Pine Marten was open, so I pulled in and parked, with my sights set on riding the Cirque Bowl and then back down as far as possible to the car. 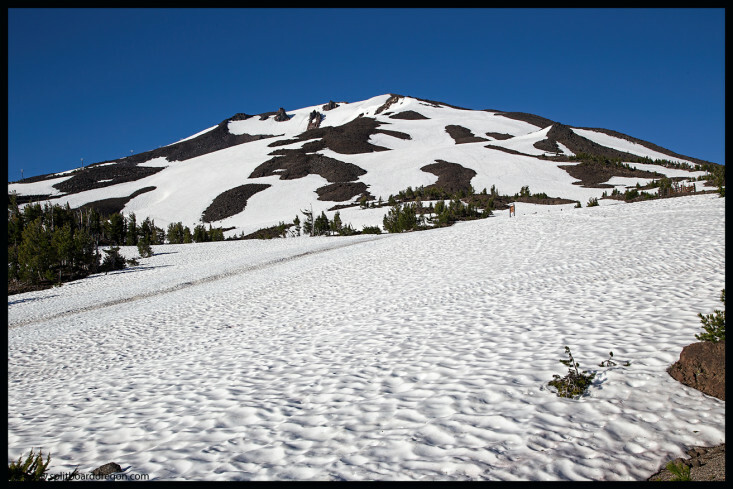 Shouldering my pack, I headed up the hill and walked on dirt under the lift towards the halfpipe, where continuous snow started….. Even though it was just after 6:00 am, it was already warm and the snow was starting to soften. I skinned up through the Canyon run, eventually working my way up towards the top of Pine Marten, where I got a good glimpse of the upper mountain and what I’d be riding…. I crossed the snowplowed road at the top of Pine and worked my way up, easily skinning the steeper slopes of the lower part of the upper mountain. Looking back to the northwest, the views of South Sister and Sparks Lake were scenic as always in the early morning light…. I was able to skin to the large cornice feature a few hundred feet below the summit, at which point I put my board in ride mode and pondered options for awhile. 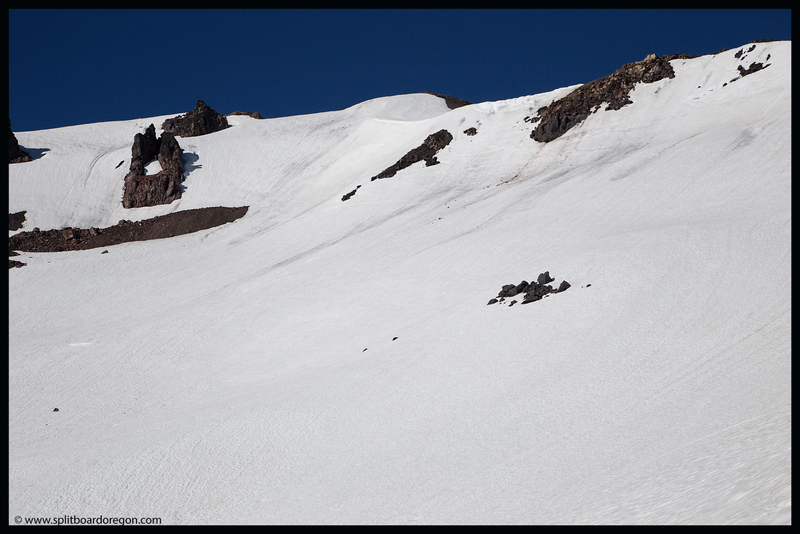 Going to the top would provide more turns and better views, but the snow from the cornice looked enticing. 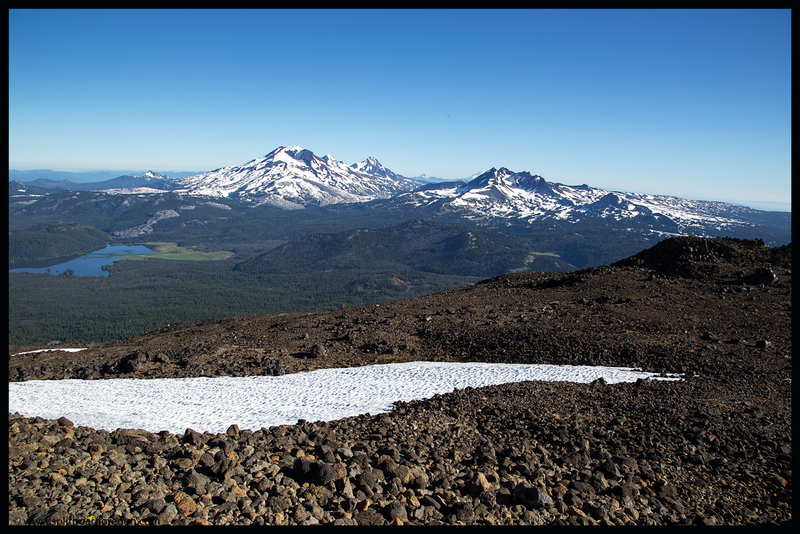 While I thought it over, I snapped a few photos, including the one of Broken Top below. If you look closely you can also see Three Fingered Jack, Mt Jefferson & Mt Hood. 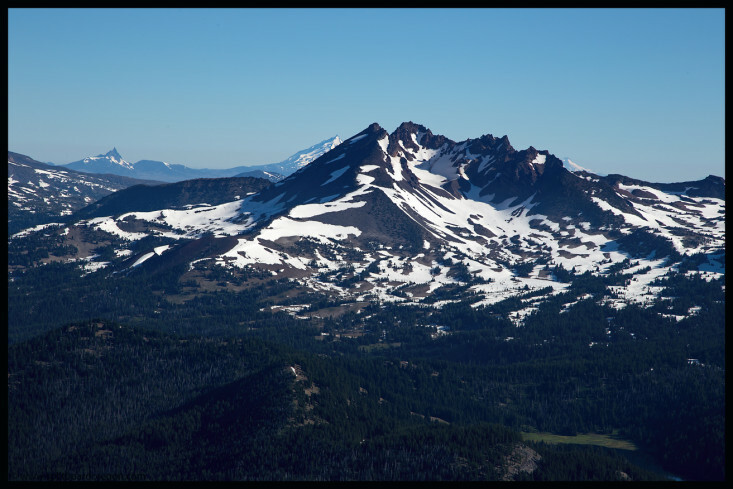 Given my timing, I decided I had time to head to the top, and started hiking up the faint trail of the northwest ridge to the summit. Arriving at the top, I was glad I made the decision to keep going, as there was more snow higher up than I’d thought down low, and it looked like the turns would be excellent. Before strapping in, I busted out my tripod and snapped a few self portrait shots…..
A few minutes after 8:00 am, I strapped in and headed over the edge into the Cirque Bowl. Sitting all alone on top of the mountain prior to dropping, I was stoked to ride nearly 3000 feet of corn with not a sole in sight on a mountain that literally would see thousands of people on a powder day in winter. 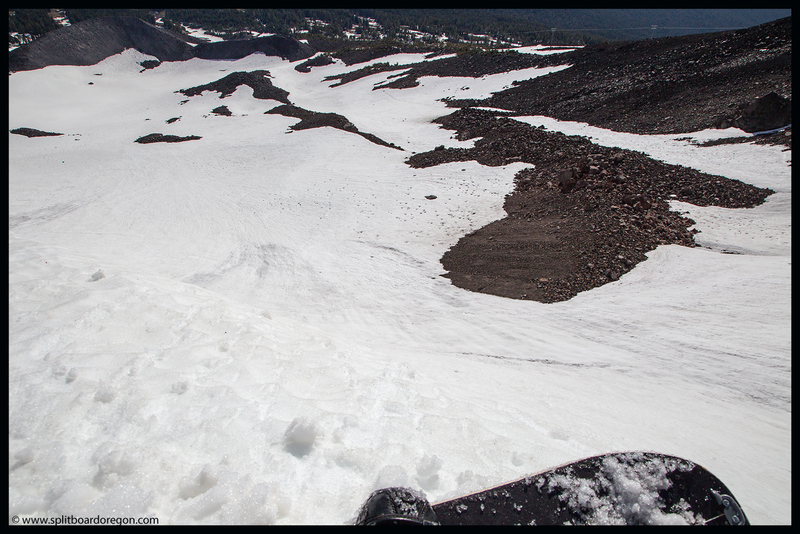 I found the steepest point off the top to drop, and made smooth jump turns down the pitch, working my way down to the mellower slopes below. 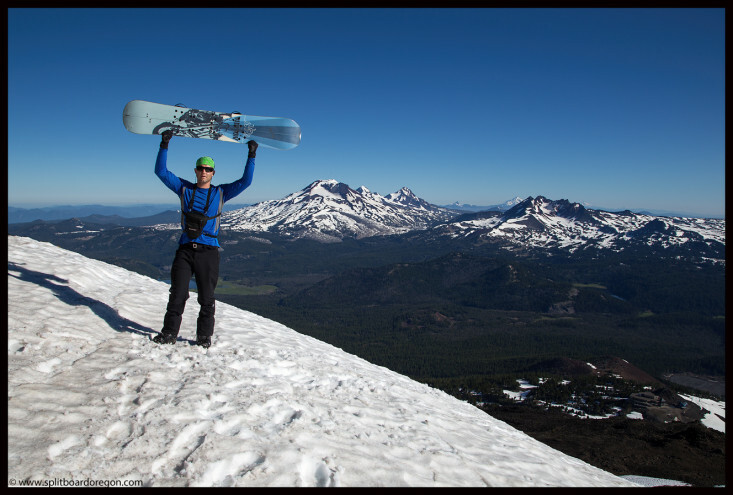 At the bottom, I traversed across to the west side of the bowl and made premium turns for nearly a thousand feet, airing off the natural quarterpipe along the west side of the bowl a few times for extra fun factor. Near the bottom of the bowl, I hopped out of the Cirque and rejoined up with my skin track from earlier, making smooth corn turns all the way down to the cat road above the Pine Marten chair. 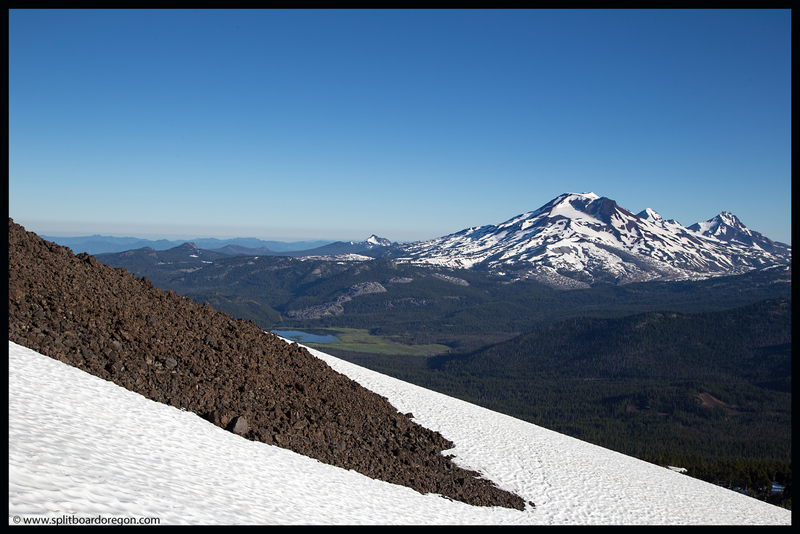 After a short boot up the road, I joined back up with my uptrack and milked the lower mountain for all it was worth. Lots of fun turns were had, and I finished out my run on Coffee, linking the final snow patches below the halfpipe to within a couple hundred feet above the parking lot. I got to the car around 8:30 am, and was stoked I’d be back at camp in time for breakfast. 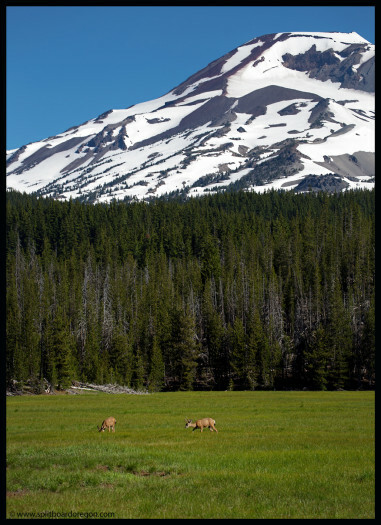 On the drive back to Little Lava, I had to stop and shoot a few pictures of a coupe of mule bucks feeding in the meadow at Sparks Lake below South Sister…..